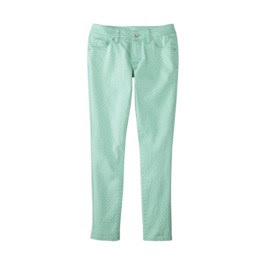 I've been loving the mint, cropped, skinny jeans I've seen girls wearing the last two summers. So cute and fresh! So while in Target yesterday, I tried on a pair. And well...things did not go well. Let me first describe my body shape. I have an abnormally big head and long chimpanzee arms. My waist and bust are large and in charge. My booty is similar to that of a 3rd grader- flat and barely there. And my legs are long and very thin and shapely (my best feature). They look like ballerina legs. I'm built like a bobble head. It's a wonder I can stand upright! So as long as I am careful to wear a top that fits properly (read: is long enough to balance things out), skinny jeans really work well for me a lot of the time. But these jeans (I couldn't find the exact pair online- they were solid- not polka dot) b a r e l y made it up and then off of me. They were decidedly not skinny jeans. These suckers were anorexic jeans! I don't know who is supposed to fit into them. They were not juniors either. And the waist fit fine. But when something is tight on my skinny legs, they are not going to fit normal American made legs for sure! Any tips? Have you seen a cute (and inexpensive because I am never willing to pay much for what I consider to be a trend...and mint green jeans are most certainly a trend and not a classic) pair lately? Please share! Ann Taylor Loft has perfect skinny jeans! Your body description had me in stitches. I am positive those jeans are designed for middle school girls who have yet to go through puberty. Any pair that I've tried on had not a chance of going over my calves or thighs. I wish I had skinny is legs! Very jealous. I have had luck at the J.Crew Factory...it's where I got my white jeans. I just laughed out loud at my desk. :) I will never again try on Old Navy Rockstar skinnies for this very reason. I know many peple love them but they make me feel like a giant. Depressing! One more thing - I love At LOFT skinny jeans. If you haven't, give them a try! Have you tried Old Navy? Not sure what colors and prints they have right now, but I love their skinny jeans/pants. Super affordable too. Do NOT fret over the Target jeans my friend. They are awful and run super tight on me too! Even if I were to go like 3 sizes up they would still be super tight. They are made for high schoolers. I have found some good skinny jeans from Gap! I totally know what you mean! I tried on a pair at Banana and I couldn't get it over my leg!! Have you tried Loft? I had some good luck with a cute pink pair last year! You are so funny! I have never thought your head was abnormally large or that you have chimpanzee arms! My problem with jeans is that they need to be larger in the waist. I have no choice but to buy low-rise, which is convenient because I love low-rise, so there is no tightness in the waist. But I need them to fit tight on my hips and rear, otherwise they slide down (and annoy me all day) and get baggy in the bottom as they stretch out. There is nothing worse than a baggy seat. I've found that stretchy jeans, although they seem to fit better when I first put them on, are the worst option for me because they stretch out in bad places, like the rear. I've had much better luck with nonstretchy jeans that just fit well in the hips and rear. Sorry, that didn't answer your question about where to find mint green jeans, but just wanted to commiserate with you for a moment. :) Hope you're doing well!